THE AEOLIAN SKY WAS A BIG MODERN FREIGHTER, with superstructure and engines at the rear and four massive holds separated by equally massive masts and cargo derricks. Depending on how you regard these things, the Aeolian Sky is a fairly recent wreck - she went down in the same year I did my first open-water dive. 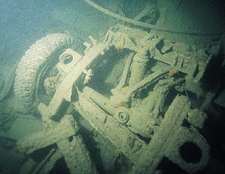 I didn't dive it then, but over the years I have seen bare patches of paintwork erode and become covered with dense carpets of hydroids, and the structure of the wreck slowly collapse to its present half-intact state. Each time I have had an enjoyable dive and discovered something new about the wreck, and there is no doubt much more to see. 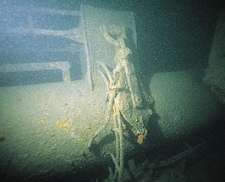 Resting on its port side, the stern and superstructure are reasonably intact, but the holds have collapsed towards the seabed, leaving them less than half their original width over most of the length of the hull. Local charter boats seem able to drop a shot reliably just forward of the superstructure, so that is where this month's tour starts (1). 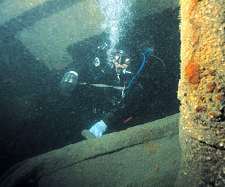 To get your orientation, head back along the upper starboard side of the wreck at deck level, only about 18-20m deep, until you meet the superstructure (2). If you are new to the Sky, the superstructure will keep you quite busy enough for at least one dive. There is easy access to companionways and cabins, with open hatches and large windows to swim through. Just use a bit of commonsense about which areas are safe to swim through, depending on the visibility. Being a modern ship, the funnel (3) is just a decorative cover for an exhaust pipe from the engine. It has broken at the base and provides one means of access to the engine-room. Other access routes are available through nearby doorways. With good visibility, caution and a reel, it is possible to penetrate straight "down" past various bits of auxiliary machinery to the engine itself. Behind the superstructure is a surprisingly large area of stern deck, dominated by a large winch with cable still wound on it (4). Over the stern the rudder rests folded towards the seabed at 30m, but the propeller was salvaged soon after the ship went down. From near the propshaft, breaks in the hull can provide an alternative route into the engine room, with the prospect of a swimthrough "up" past the engine and out through the superstructure. Back above deck, one of the cabins just below the funnel was the sickbay (5).I don't know exactly which cabin, but I always have a look, because when the Aeolian Sky went down there were several million pounds worth of Seychelles rupees stored in strongboxes in the sickbay! Initial salvage efforts soon after the sinking were concentrated on recovering these banknotes, with commercial divers and police diving teams involved. The strongboxes were never found, though a fair selection of notes were found "washed up". I write that in quotes, because there are always rumours of an anonymous local diver who got there first! Proceeding either over or through the bridge area (6), in good visibility I like to drop away from the Aeolian Sky towards the seabed and look back at the wreck. On a good day the water has been clear enough to see the whole superstructure stretching out above me - an impressive sight when you consider the size of the ship. The first pair of masts (7) lie flat against the seabed just aft of the sternmost hold (8). The hold area is surprisingly full of debris, especially when compared to the other three holds further forward. Depending on your dive plan, this might be a good point at which to head for the upper side of the wreck and release a delayed SMB or ascend the shotline. Forward of this hold, the upper starboard side of the hull has collapsed considerably towards the seabed (9). Piled on the seabed is the first sign of the heavy steel pipe that must have formed a significant part of the cargo (10). Now midway along the holds, an enormous winch (11) is followed by a mast a good 3m in diameter (12). It is worth swimming out to the top of this mast to view the gantry and pulleys, with cargo derricks resting on the seabed either side of the mast. Back towards the deck and forward of the mast is another winch and a bigger pile of steel pipe (13). Following this wreckage close to the seabed brings you to another pair of more normally proportioned masts, followed by one of the more interesting pieces of cargo - a Land Rover chassis (14). The forward hold is the site of yet more steel pipes (15) followed by another Land Rover chassis (16) resting just above the bow (17). Forward of the bow is the double rear-axle assembly of a truck chassis (18). The Aeolian Sky was carrying a number of Land Rovers, dumper trucks, tractors and other vehicles. Before the hull collapsed to its current state, many more of these were easily accessible in the holds. There may well be others scattered on the seabed that I haven't seen yet. For the first few years after it went down, the holds were much more intact and it was easy to cruise along the length of the wreck, in and out of the holds. Exploring inside the holds now is a much more serious undertaking. 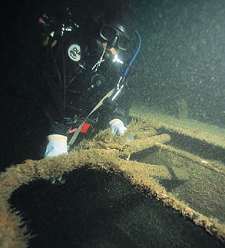 The bow of the wreck is intact and twisted forwards. Towards the keel, a large bow bulge rests against the seabed at 30m ( 19). Lower down, the bow is pointed, but above the waterline it spreads to a wide curve at deck level, rising as shallow as 20m. The starboard anchor is still in place, resting against the hull (20). It is much larger than that found on most wartime wrecks, suitably sized for a large modern freighter. I would guess that the corresponding port anchor now lies trapped between the bow and the seabed. The taut anchor chain leads from the top of the hawse pipe to an anchor winch that spans the width of the bow (21). Last time I dived the Aeolian Sky to check my sketches and take some more photographs, it took me 45 minutes to get to this point and pop a delayed SMB, so divers without nitrox will probably want to split my route into at least two parts. TIDES: Visibility is usually best at high water slack, three hours after high water Portland. Low water slack is two hours before high water Portland. HOW TO FIND IT: The position of the Aeolian Sky on GPS is 50 30.572N 002 08.426W (degrees, minutes and decimals). There are no convenient transits, so you need to search with a GPS and echo-sounder. It's a big wreck lying across the current with its stern towards the shore. LAUNCHING: Slips are available at Weymouth, Portland, Kimmeridge, Swanage and Poole. ACCOMMODATION: There are many B&Bs, small hotels and campsites. Contact Swanage Tourist Information (01929 422885). QUALIFICATIONS: Shallow enough for less-experienced divers to make worthwhile no-stop dives, yet big enough to justify extended decompression dives for more experienced divers. FURTHER INFORMATION: Admiralty Chart 2610, Bill of Portland to Anvil Point. Ordnance Survey Map 194, Dorchester, Weymouth and Surrounding Area. Ordnance Survey Map 195, Bournemouth, Purbeck and Surrounding Area. Dive Dorset, by John & Vicki Hinchcliffe. The Diver's Guide to the Weymouth & Portland Area, Weymouth & Portland BSAC. Dorset Shipwrecks by Steve Shovlar. PROS: An impressive modern wreck with lots to explore. A worthwhile alternative site when the sea is too rough to get round Portland Bill. CONS: Current picks up rapidly at the end of slack water. Divers decompressing on delayed SMBs can disperse over a large area. GETTING THERE: Follow the A351 past Corfe Castle to Swanage and follow the signs for the town centre and pier. Parking on the pier is limited, so be prepared to drop divers and kit and use the car park further up the hill.